It’s the start of February tomorrow, and I still can’t figure out where the last month has gone. Since Christmas, my diary has been filled with personal travel and work trips. From Perth to Cambodia, back to Sydney and onto Los Angeles it’s been a busy month to say the least! I love my job, and travelling is always welcomed so it’s nice to combine the two doing what I love. Going from Southern hemisphere to Northern can be a bit of a struggle this time of year, but LA wasn’t as cold as I secretly hoped for. I was still wearing a blazer and denim shorts just like I have been in Sydney recently. But with the weather being all over the place right now, I have decided no more summer purchases. I’m not giving into this indecisive climate! The autumn wardrobe building has begun. As mentioned in my last post, I have ditched the majority of my heels and replaced them with loafers, which in turn compliment skinny trousers over wide legged. I love the shape on todays cigarette pant, and they make a nice change to denim or pair of culottes. Autumn will be a good season to style a knit or lightweight trench with them. For now, a white shirt does just the job and the breathable fabric means it’s perfect for a humid day in Sydney. The open back also adds a less corporate feel to the look. Perfect for my social media role Monday-Friday. Yet again, Target has done it again, making my work life easier to dress for in the mornings whilst staying true to my relaxed tailored style. There's always a time for a classic little black dress. Going against popular belief, the LBD is a great option for a warm summers day. I’m not one to usually wear short dresses especially for a night, out so much prefer to style for a day out with a good pair of flats. For work, brogues or loafers are usually my go to shoe, as have to commute on a daily basis. I usually have a tight connection between my two trains so the flats make me get a move on way too early in the day! I usually find this type of footwear isn’t always the most flattering for my height, but starting to accept it as I pin more and more casual tailored looks onto my Pinterest boards. Over the last few weeks, I have had a big wardrobe overhaul. I am actually pretty good at sorting through and organising the racks every couple of weeks, but now we are into a New Year it seemed the perfect time to reduce the styles I want to wear for a more minimal 2016. 1. Currently swapping the heels out for more loafers and brogues. High shoes are not worn enough to be the main style within my closet. They are great for nights and styled with tailored pieces that need a touch more height (eg. wide legged pants and flares) but not for my everyday. 2. Overhaul of jackets. Ones to keep - Blazers, trench coats and double breasted jackets. For the likes of Kimonos and denim, they unfortunately just don’t fit with my tailored style anymore and just aren’t that flattering. 3. Filtering the playsuits and jumpsuits. I have so many that just aren’t comfortable or simple enough. I love a good jumpsuit, but sometimes I buy one for the hanger appeal and not the feel or comfort. I had so many beautiful styles but unfortunately they just weren’t wearable for everyday. 4. Time to bin the boho jewellery. It’s all about dainty jewellery that's eye catching, and a good timepiece. Less is more right? Just before moving to Sydney, I loved statement necklaces and beads, but over the last year have been replaced by slinkier arm wear and bolder designs. I have also been investing in more high end pieces that will last me for years to come. In December, my Baby Audrey Celine’s were high on my wish list, so decided to treat myself! I’d like to be able to do this every couple of months as my wardrobe becomes more wearable for everyday. Would love to know how you’ve all cleaned out your wardrobes for a fresh New Year and what’s high on your wish list this year. I have a feeling I will be spending more of my hard earned cash as the months tick by! 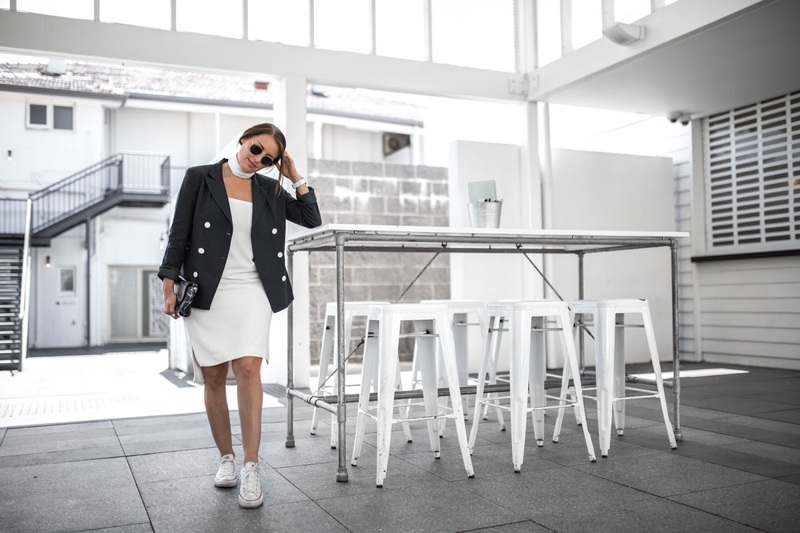 When the humidity accelerated in Sydney a few weeks back, one thing was on my mind…..How am I going to survive another Australian summer staying true to my style? I must admit, Autumn is the month my wardrobe loves me best. Each piece gets a lot more love with the thanks to layering. This summer, I am trying to invest in pieces that I think will see me through a few seasons. Don’t get me wrong, it’s not easy shopping this way, but it definitely makes my wardrobe smaller and enables me to wear pieces a good few times. Summer is also a great time to shop in the UK sales, online from Aus. The likes of Zara, Cos, Topshop and Asos have some of the best sales and it’s a chance to pick up a winter bargain or two that will be on trend for the colder months Southern Hemisphere. Today’s blazer I picked up in the Topshop sales, and although the temperature was nearing 35 degrees the day of purchase, it doesn’t mean you have to set you mind to thinking that you won’t get the wear from it. A classic jacket is always a winner. Over the holidays you may have seen over on my Instagram that I headed to Perth with my loved one for my first Christmas away from home. I was nervous to be out of my usual routine watching Home Alone wrapped in a blanket after a turkey coma with the family, watching the Queens speech at 3pm. Thankfully my partners parents are both British, which meant a Turkey roast with all the trimmings was awaiting me. Thanks to Snapchat, I managed to catch up with one blogger that I met at Fashion Week. Jiawa Liu from Beige Renegade blog. It turns out she lives close to Chris’ parents, so a spontaneous meet up happened on Boxing Day. It’s awesome meeting fellow creatives, and we had a blast of a day drinking epic milkshakes and getting some killer shots. Todays location was at Cottesloe Beach Hotel and I couldn’t help but have a nerdy jaw dropping expression thanks to the interiors being clean and minimal. Hopefully that doesn’t show in these snaps! 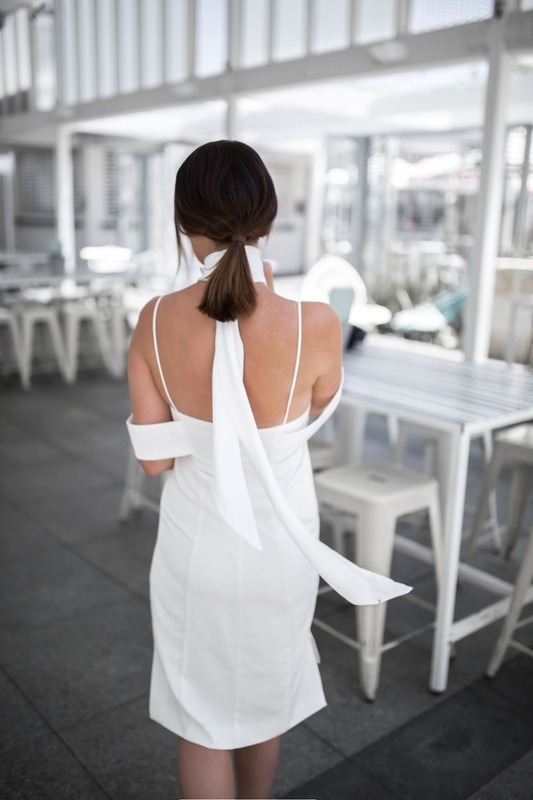 The LWD (little white dress) is from one of my favourite Sydney boutiques, PS the Label. 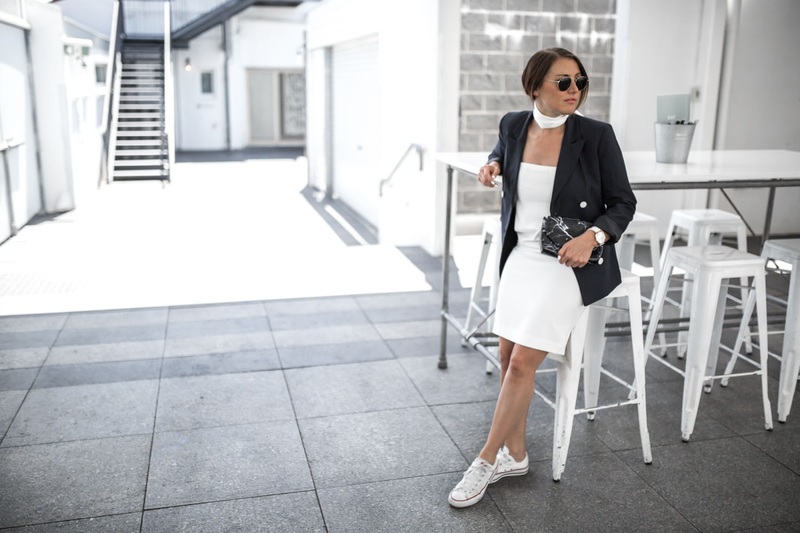 It’s quite easy to style a white dress up a little too much when worn with heels, but wanted todays look to be more of a relaxed one, so opted for a pair of old kicks. It’s quite fun turning a dress into your own, styling it differently from the online lookbook. The outfit was finished off with a marble bag, silk neck tie and trusty round Raybans. 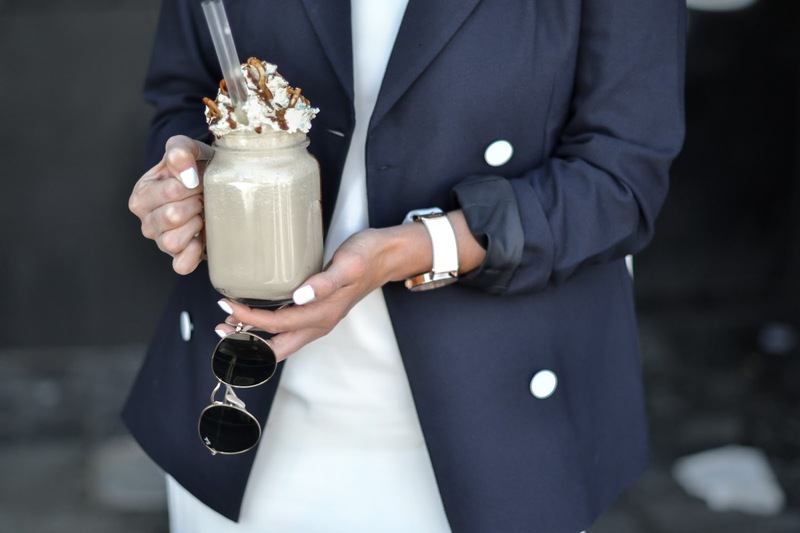 The perfect look to ease back into work. As I write this post in Phnom Penh airport, it’s back to reality in a couple of days after a beautiful and much needed relaxing holiday to Cambodia. It was an opportunity to sit back, relax and catch up on some creative time. As some of you may know, I work a full time job as well as running Boho Tailor. Holidays are a perfect opportunity for me to create some new content for the coming weeks, edit some blogposts and to gain inspiration for upcoming posts. I must say that this trip has also been a great balance of lazy days and spending quality time with my other half. December was a busy month in the office, so blog posts took up the majority of my evenings and weekends. It’s nice to finally catch up a little and very much looking forward to January being a smoother month, and it will be nice to catch up with some of my Sydney friends over a nice cup of tea! Todays look is of a relaxed nature. I am usually pretty good at packing, but this trip was a bit of an overweight luggage mission. I packed so many looks as thought they would be cute to snap but genuinely spent most days in the same shorts for 3 days with only changing up a bikini! It’s funny how lazy you can get when totally chilled out. I’ll have to remember that when packing next time! 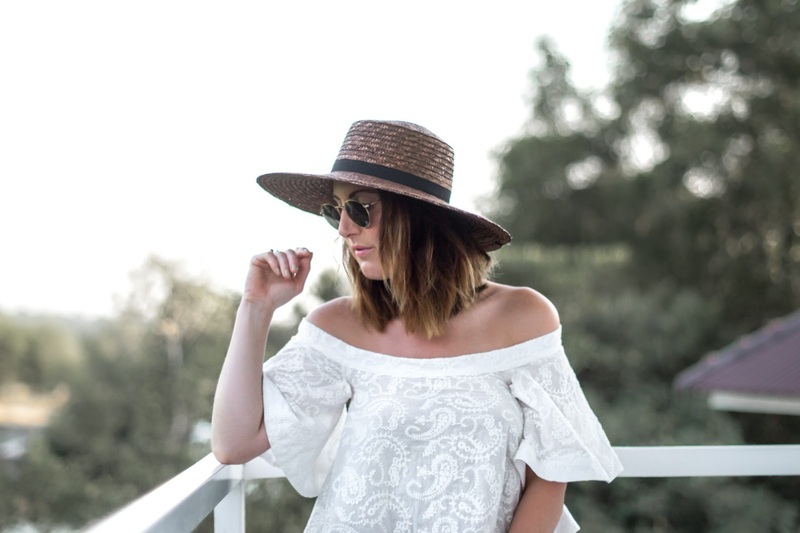 Off-Shoulder has definitely been a popular style this summer, and I couldn’t resist this Staple The Label number in the tropical heat. The backless design was just what I needed, paired with silk shorts that were so comfortable they are my go to item for the long flight home. When your wardrobe consists of neutral colours, the detailing of fabrics can sometimes change up the style that touch more. 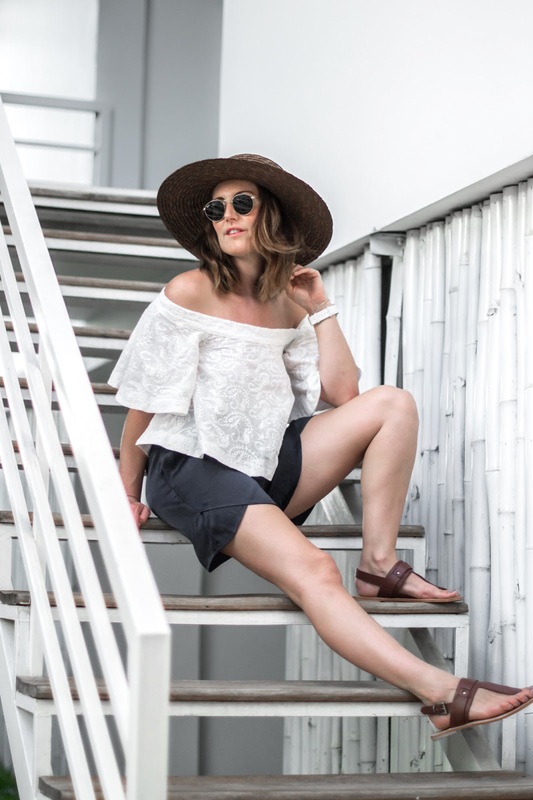 The intricate Broderie Anglaise style of this top gives the look a much needed lift and also gives me a good reason to invest in it even though I have a couple of white off-shoulders this season. Comfy shoes are a must when travelling and love the simplicity of these beauties. These are my first pair of tan sandals this season, so will get some good wear from these in the coming months. 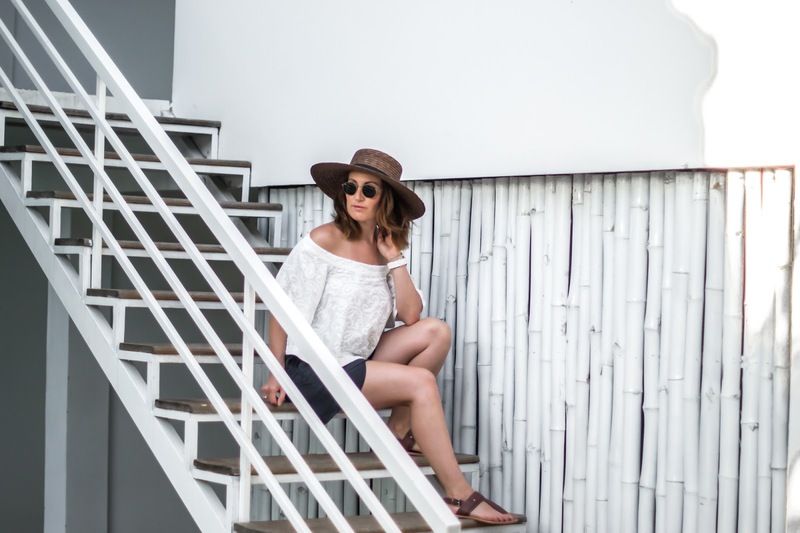 A South East Asia look (and any continent in my books) isn’t complete without a straw hat and I find it hard to not pair mine with every look. Let’s just say I have a slight problem with wide brim hats this season! I hope you guys have been enjoying my snaps around Cambodia. Chris and I have seen some amazing places, I am sure you’ll see more images crop up in the coming weeks over on my Instagram as have so many to share.